Pizza night is ON with this four cheese pizza with tomato basil arugula salad! It's super easy to make and tastes ridiculously amazing. In a medium bowl, sprinkle the yeast over the warm water and stir to combine, the let it sit and proof for 5-10 minutes, until slightly foamy. Meanwhile, in a separate mixing bowl, combine the flour and salt. Turn the paddle on at low speed and drizzle in the olive oil slowly, mixing until combined. Pour the yeast mixture into the oil and flour mixture and mix until completely combined. Prepare a clean bowl with a little extra oil so that the dough won't stick to the sides while it rises, then scrape the dough into the bowl, turn to coat in the olive oil, and cover it with plastic wrap. Let the dough rise for 1 hour, or place the dough in the refrigerator for up to 3-4 days. To prepare the dough for pizza assembly, divide it into three roughly equal parts. Roll out each ball of dough on a lightly floured surface to form a very thin crust, then transfer to a clean baking sheet and repeat with the remaining dough. While oven is heating, drizzle 1 tablespoon of olive oil over each of your three pizzas and gently brush over the crust. 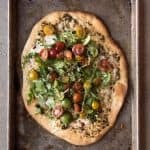 Sprinkle with a little salt and pepper, then spoon 2 tablespoons of pesto onto each pizza and gently spread it around the dough, leaving a slight margin around the edges to create a crust. Arrange the slices of fresh mozzarella with 4 slices to each pizza, then sprinkle the fontina, goat cheese, and Pecorino Romano over each pizza. Bake each pizza until the crusts are golden and the cheese is bubbly, around 12-15 minutes. While the pizzas are baking, heat 1/4 cup of olive oil in a medium saucepan over medium-high heat. Add the garlic and stir, just until fragrant and lightly golden (but not brown). It should take less than a minute. Remove from heat and immediately add tomatoes and stir, giving them a chance to warm up from the residual heat in the pan. Let the tomatoes, garlic and oil sit for a few minutes to cool before adding the balsamic vinegar and basil, and seasoning with salt and pepper to taste. Toss to combine. Top each pizza with a handful of arugula, then spoon some of the tomato basil mixture over it and drizzle a bit of the pan juices of the top. Slice and serve.